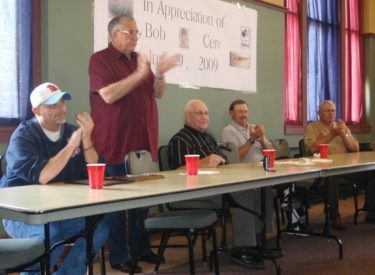 Bob Cerv managed the BJ’s off and on from 1970-1982. He led the BJ’s the the 1979 NBC title. He coached players in Liberal like current coaches Galen McSpadden and Mike Hargrove, Ron Guidry, Doug Drabek, Phil Garner, Mike Moore, Rick Honeycutt, and Steve Bartkowski. He had a record of 364-100 at Liberal. Cerv played in the Major Leagues from 1951-1962 for the Yankees, A’s Astros, and Angels. He his .276 with 105 homers and 374 RBI’s. He was an all star in 1958 when he blasted 38 homers for the Kansas City A’s.